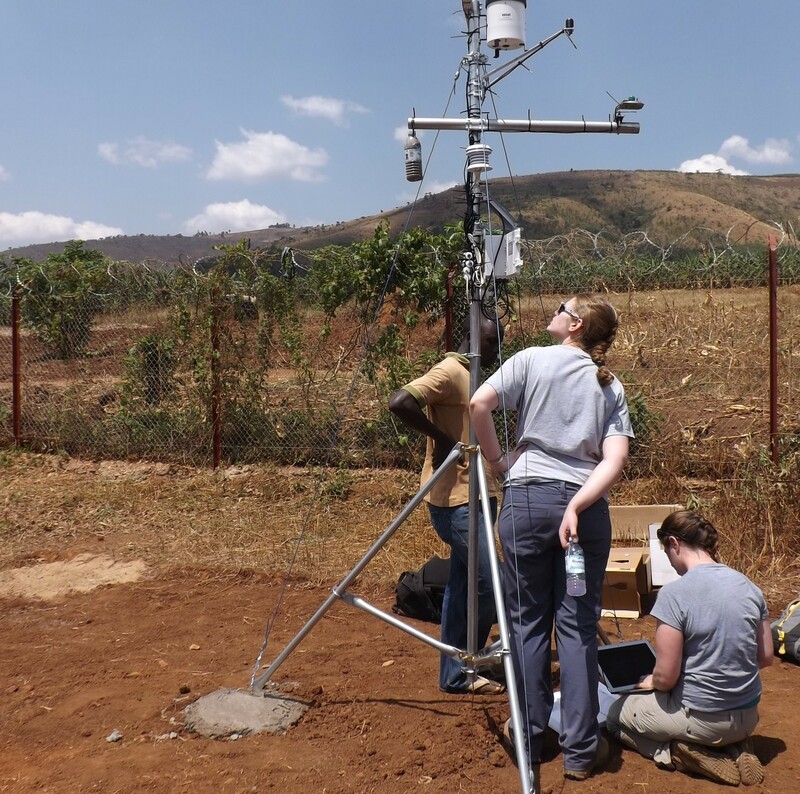 What new challenges could rural Uganda possibly have for a weather station that has been deployed in deserts and on glaciers? We would soon find out. 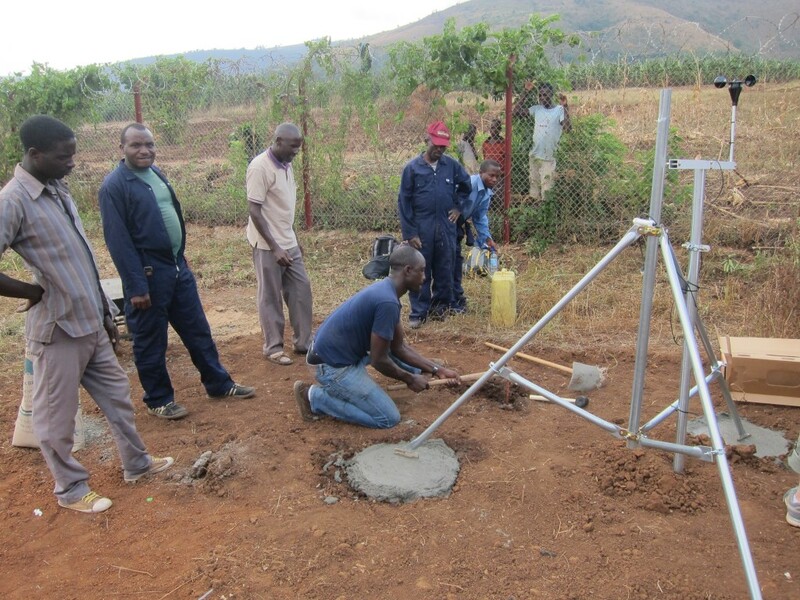 The Safe Global Water Institute (SGWI) added a renewable energy focus this year. We know it is sunny in Africa, but how sunny? There is wind, but how strong? The data we were looking for was not readily available. 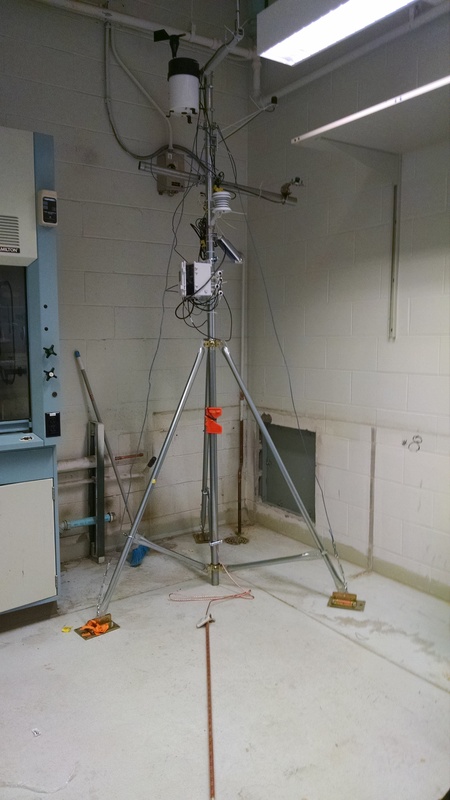 The lack of research and the desire for specific site information lead us to purchase a weather station for site evaluation. 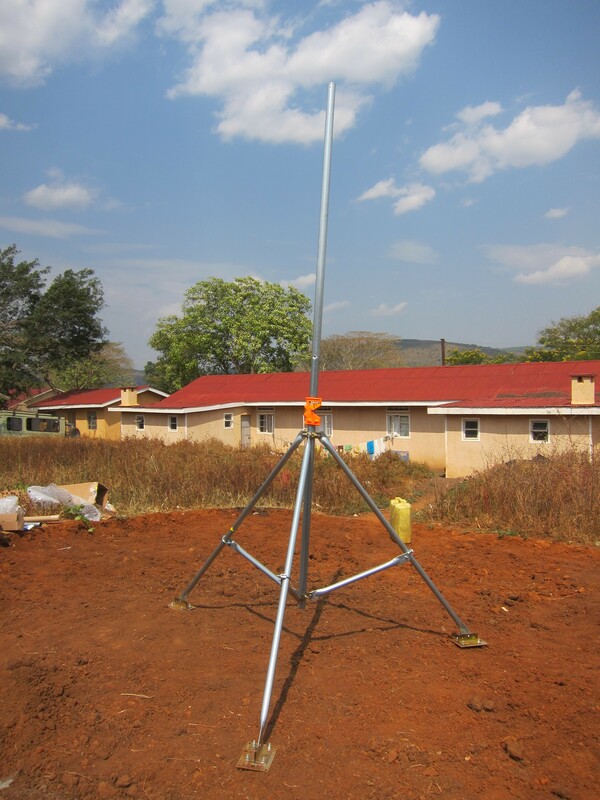 The weather station will be used to measure the solar and wind energy potential starting in the Oruchinga UN HCR refugee settlement. Oruchinga is in the Kalagera river valley in rural south-western Uganda. 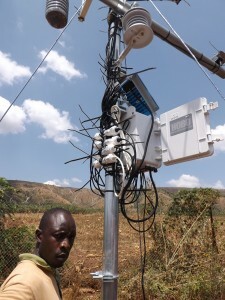 In one or two years, when the river valley data collection is complete, we hope to relocate the station to Omurutoma, a nearby hill top village. It took two weeks to pick out the weather station components. When the equipment arrived in Urbana, again, it took two weeks for a test build, to make hardware adjustments, and check software settings. We assembled the weather station on site in less than a day. There were last minutes challenges during the test build on campus, of course: a software incompatibility, a last minute sensor mounting change, and finally a last minute weather station data logger case modification. The data logger was picked up from the machine shop at 9 AM. We departed for Uganda via O’hare at 10 AM. Plenty of time. Traveling with a three meter tripod, even folded and separated in half, is a sight and a little cumbersome. Reggie took on the tripod box as his travel companion for the week. 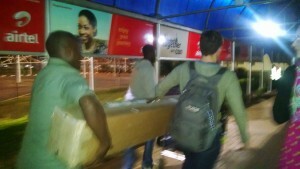 Here he is carrying it at the Entebbe airport. Did I mention, a site had not been picked out before we arrived? We knew we wanted it in a guarded area, which was about it. The Commandant walked us around base camp, a fenced space with governmental and aid offices, showing us options. The location selected was the flattest protected location with no trees and where both horizons were visible. Downside one, it was next to the garbage pit. Solution, two Ugandan men (referred to as National’s when near a refugee settlement) were hired to dig a new pit away from the selected weather station site and fill in the old pit. Downside two, the ground was covered with burrs and brambles. I was covered after tromping through them to survey the area. Jeremy Guest, one of the two Illinois professors on the trip, found a path. The same men also cleared out the brush in the installation area. Surprisingly, the site preparation was complete by lunch the next day. Cement, sand, and gravel are best purchased (or found) in country. The renewable energy team, Ellyn, Madeline, Tim and myself, visited the Mbarara town center to get supplies first thing the morning. 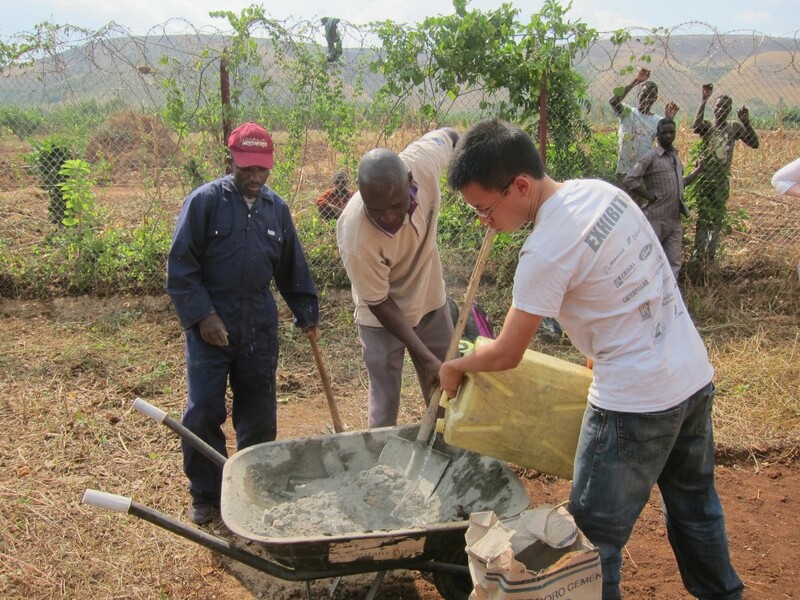 Moses and Jimmy, two of the guides, took us to get cement, a ladder, and WD-40. After some walking and asking directions every block, we finally found a ladder, the hardest item to get our list. Apparently, most people in Uganda make their own ladders out of trees. This was the most urban walking around we did. It was not possible, but would have been nice, to take pictures. The town center was bustling at 8 AM. There were women walking through the streets selling food and drinks. Some had canteens of hot drinks. Others, selling food, had stacks of prepared plates, each covered with a bowl stacked, one on top of each other, and placed in a plastic sack. The women would serve the food and drink, waiting nearby to collect the dishes when the customer finished. There were men, motorbikes, and cars everywhere in the roundabout and streets. The area was a maze of streets and alleys. 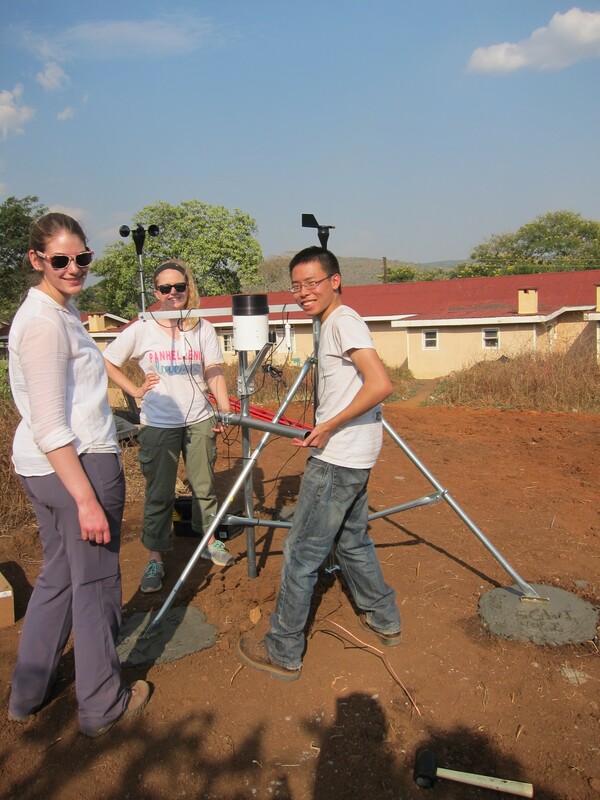 The weather station crew started work after lunch. 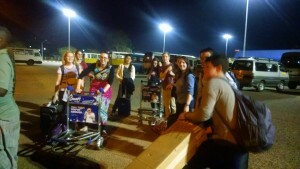 The installation team was joined by our guide Moses, a couple hired Ugandan nationals, and plenty of refugee and national onlookers. Placement of tripod base to set location of concrete pads. This “simple” step involved two men, then four men used hoes to excavate holes for the concrete footings. They were so enthusiastic; it was difficult to stop them once they’d started. One of the holes ended up significantly larger and deeper than intended. 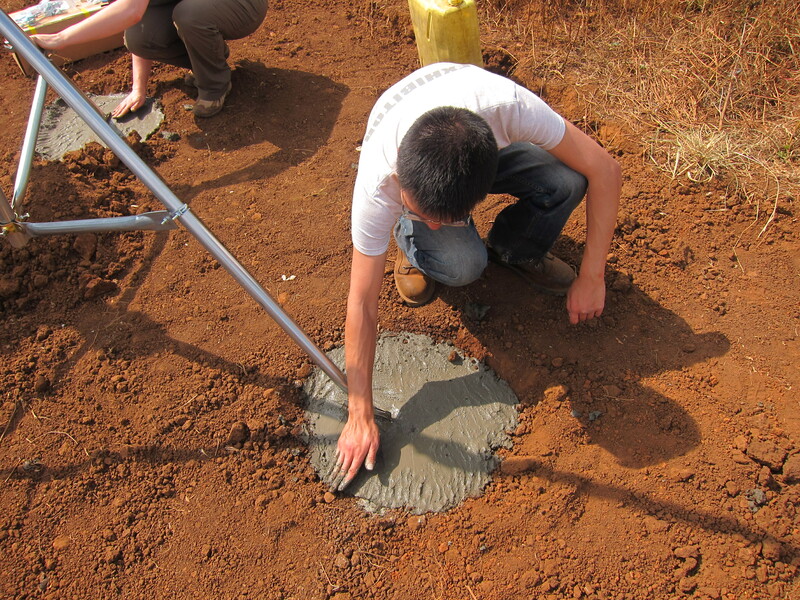 The Ugandans made cutting into the hard clay soil look easy. Then it was time to mix concrete. The concrete mixing did not start smoothly; it started with us saying “wait” and “stop” a lot. The aggregate for the concrete was too big. The hired men wanted to mix the concrete and didn’t want to listen to our suggested ratios. Then Tim stepped in, taking the lead. He made them remove some of the aggregate, pour the water slowly to better judge the concrete viscosity, and the first layer of concrete was poured. The tripod legs were set up and leveled. Concrete with only sand was poured on top of that. A little creativity and the surface ended up being somewhat smooth. 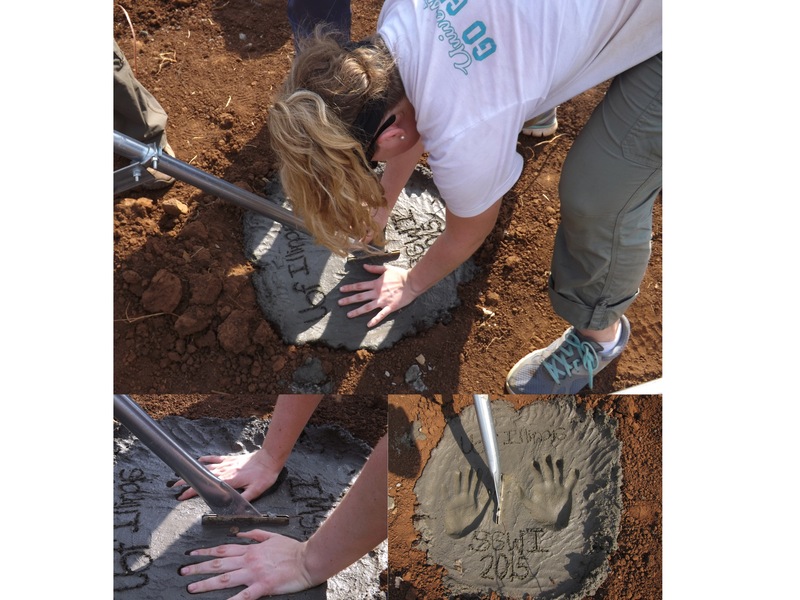 Smoothing concrete using the tools available. Check out Madeline’s signature on her tripod foot. Madeline’s creative addition to the weather station installation. First our guide Moses used a mallet to drive a 4 ft copper grounding rod into the soil. Did I mention the clay soil was hard? The ground is so hard, the mallet handle split while hammering the rod. Moses switched to using the side of an axe head for the last foot. All of the handles and wood used in Uganda appeared to be local. They sold hammers, axes, mallet heads without a handle in the hardware store. Moses getting the final inches of the grounding rod into the soil. The team took a break around 4 PM, initiated by Ellyn. She showed the children, who were watching us through the fence, how to play with the packaging bubble wrap. None of these children attend school as the primary and secondary schools across the street from the base camp were still in session for the day. Taking a break: Madeline, Tim, and Ellyn (left to right) show local children how to pop bubble wrap. We started installing the sensors the first build day. We got the wind speed and wind direction sensor mounted. 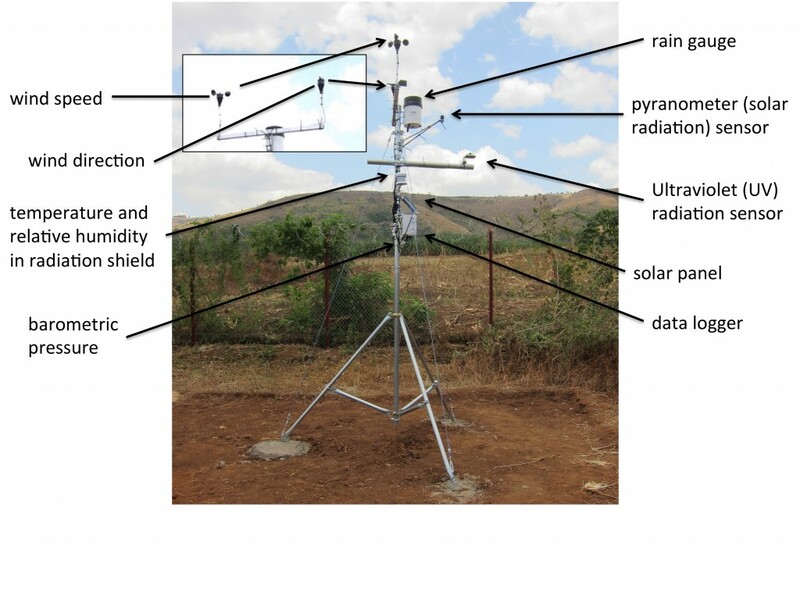 As well as the rain gauge, pyranometer (measures solar radiation), and ultraviolet (UV) radiation sensor. 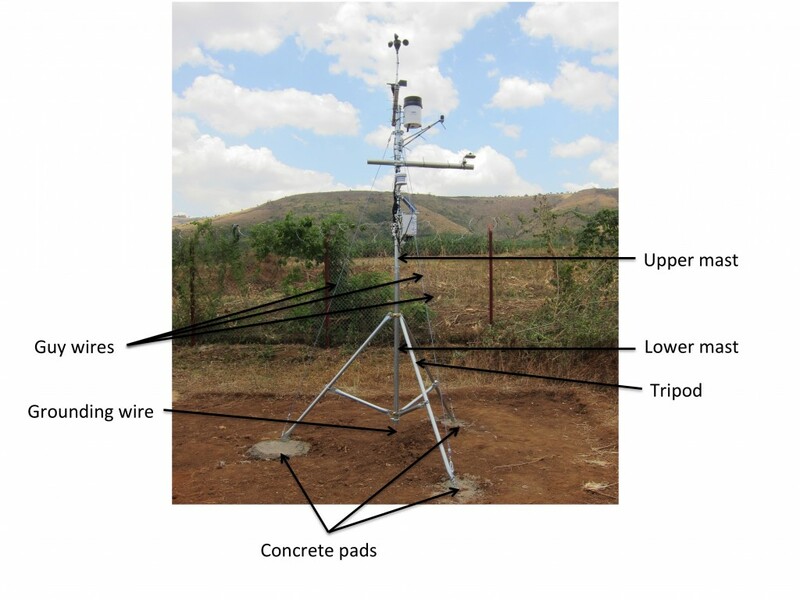 Installation of the wind speed sensor, wind direction sensor, and rain gauge. Note the broken mallet in the lower right-hand corner. We ended up leaving the weather station incomplete and not securely fastened overnight. Peter Luswata had a surprise cultural experience for the group, a traditional Ugandan dinner and dance show at Igongo Cultural Centre. The next day, everyone got up early. Oops, we forgot to tell the drivers. Once they grabbed breakfast we got going, only an hour late, to the Oruchinga Refugee Settlement. 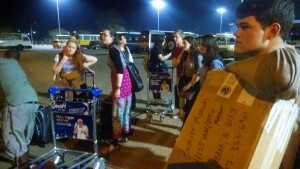 The rest of the Illinois contingent left for the weekly market in Isingiro town. 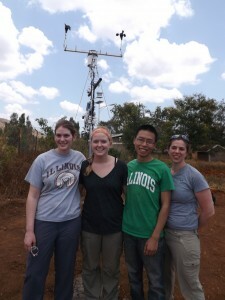 The renewable energy team + Moses started back on the weather station. I was nervous about if the weather station would be as we left it the night before. It was fine. Time for more sensor installation. Working on the weather station definitely drew a crowd. They dispersed some once the upper mast up was put in place. Getting closer, upper mast added on top of the lower mast/tripod. The radiation sensors (and later solar panel) face North to reduce possible shading since Oruchinga is in the Southern Hemisphere. We added the remaining sensors: temperature, relative humidity, and barometric pressure. The heart of the weather station, a data logger and small solar panel to recharge the data logger battery, were added last. To keep the tripod stable in high winds, guy wires were installed for the wind sensors (speed and direction). After three tries, we got the right length wires and the tripod pole was level. I went a little zip tie crazy. These wires are not going anywhere. Moses is not impressed with the wire management. 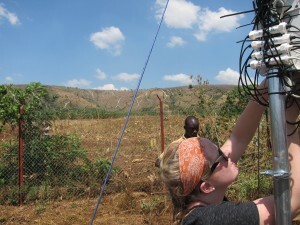 Madeline installing sensor wiring into the data logger. It was really bright out. Ellyn ended up acting as shade while I configured the software to record the installed sensors. Ellyn providing shade for the computer and checking sensor wiring. One final check to make sure everything is tight; weather station operational. We were only able to get a couple data point before we had to leave. 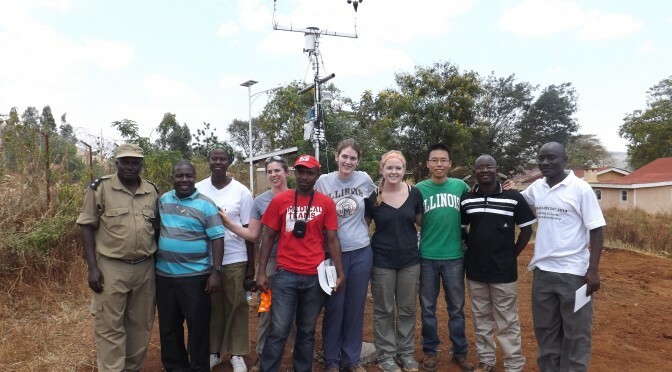 I’m excited for a couple months from now when we get the first series of weather data thanks to Richard from the Red Cross and, of course, Peter Luswata. 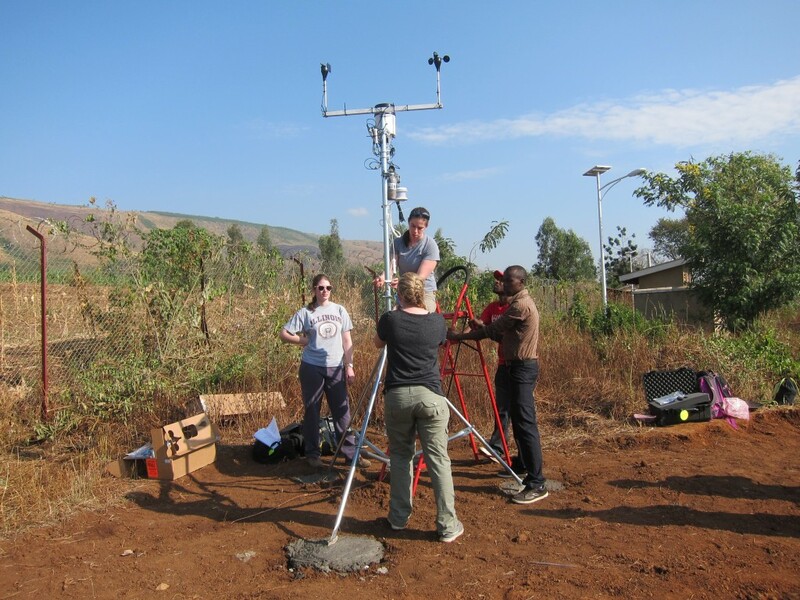 This is one of a few, possibly only the second, weather station in Uganda. As of this moment, it is installed and operational. There were many times I thought it would not happen. Still, I do not know if it will be operational or even standing the next time it gets checked on by the Uganda Rural Community Support Foundation or the SGWI. Getting it installed is a great accomplishment. Now, I am keeping my fingers crossed and hoping for data.